Aaron Thompon dribbles down the court. 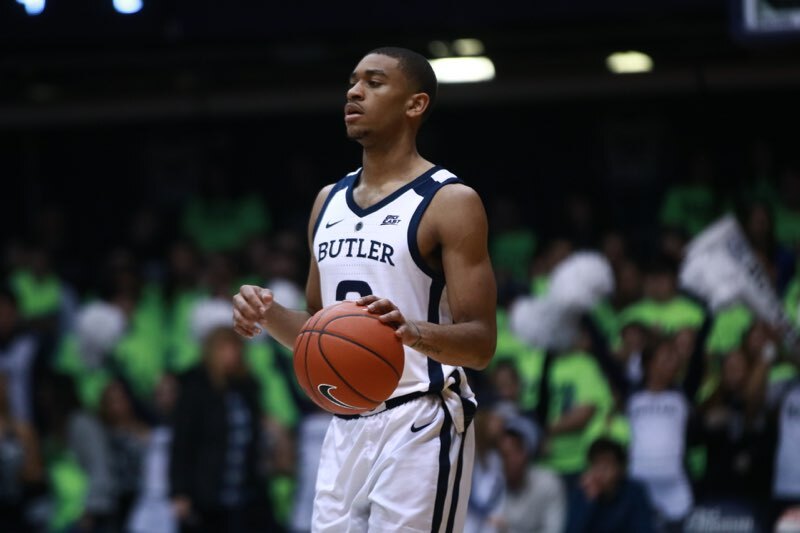 Thompson had six points and four assists in Butler’s 77-73 OT loss at St. John’s. Photo courtesy of Jimmy Lafakis. As the Butler men’s basketball team entered its pivotal game against St. John’s, they entered with what seems to be a solid starting group. Look for this to be used the rest of the year (and beyond). After getting down double-digits early, Butler kept creeping back. Bulldog fans had been through this rodeo so many times before this year. And it hasn’t gone well most of the time. The team did not play particularly well and it lead to low-percentage shots. However, late in overtime, Butler needed a bucket, and Paul Jorgensen answered with a layup to cut the deficit to two with less than 40 second left. What a finish on the run by Jorgensen there. Butler needed to have a bucket and needed it fast. Butler even got a steal down two, but the Dawgs could not convert. For a team desperately needing wins to keep them in the NCAA Tournament conversation, this will be a hard pill to swallow. Big missed chance for Butler on the road. And once again, an underlying story has been the free throw shooting. Mustapha Heron entered today's game averaging 3.7 free throw attempts per game. Tonight? He shot 10-for-12 from the charity stripe, *making* as many shots as Butler's entire team *attempted*. Heron was terrific all night, finishing with 28 points. St. John’s did not play particularly well, either, but it is the Red Storm that come out on top. St. John's tried to let #Butler win, but Butler could not oblige. Lost opportunity for Bulldogs, who did show something after trailing by 13 in first half and 11 in second. 8-of-32 3s and season-high 17 turnovers. Those are the (ugly) key stats. As a theme of the season, 3-point shooting and turnovers will likely tell the story of how Butler did. Tonight, it was pretty bleak. End of the day it wasn’t any of this crap that lost the game it was the 18 turnovers and 24% from 3, but dammit we were right there.